We’ll provide some details and insights on some of the potential top daily fantasy defense/special team value plays for week 10. Salary ranks are based on the full slate. Chicago Bears – Salaries: DraftKings (DK) – 3000, FanDuel (FD) – 4300. Chicago’s salary ranks them 12th/18th on DK/FD, respectively, making them a better relative value on FD. Chicago ranks 9th (tied) in sacks with 23 and 8th in yards allowed with 312/gm. Chicago also ranks 7th in fantasy points allowed to QBs. Green Bay ranks 18th in fantasy points allowed to defenses and gives up the 5th most sacks with 27. Detroit registered 3 sacks, a blocked kick, and held the Packers to 17 points at Green Bay last week. RT Bryan Bulaga (knee) had to be carted off the field against Detroit last week. Details of the injury severity are currently unknown but it is likely he will not play this week. Brett Hundley’s downfield play development anticipation is slow, and his time-to-throw average is a league worst at 3.12 seconds. For all current starting QBs, Hundley ranks 2nd-worst in yards per attempt with 5.04, average completed air yards with 4.9, and passer rating with 58.3. With a positive implied game script, Chicago’s matchup is solid and provides a nice mid-tier value. Update: Bulaga tore his ACL and is out for the year. Minnesota Vikings – Salaries: DraftKings (DK) – 3100, FanDuel (FD) – 4800. Minnesota’s salary ranks them 11th/6th on DK/FD, respectively, making them a better relative value on DK. The betting lines with the Redskins has the game total at 42.5 points with the Vikings as -1.5 point road favorites. The Redskins’ implied team total is currently at 20.5 points and the Vikings are currently at 22 points. The Vikings are coming off their bye. Minnesota ranks 8th in sacks with 24, 4th in yards allowed with 282.1/gm, and 3rd in points allowed with 16.9/gm. Washington ranks 24th in fantasy points allowed to defenses. Seattle logged 6 sacks, a fumble recovery, a safety, and held Washington to 17 points last week. Minnesota matches up well against Washington and offers a mid-tier value option. 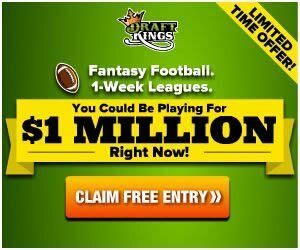 New England Patriots – Salaries: DraftKings (DK) – 3400, FanDuel (FD) – 4700. New England’s salary ranks them 7th/8th on DK/FD, respectively. The betting lines with the Broncos has the game total at 46.5 points with the Patriots as -7.5 point road favorites. The Broncos’ implied team total is currently at 19.5 points and the Patriots are currently at 27 points. The Patriots are coming off their bye. Denver ranks 31st in fantasy points allowed to defenses. Denver also gives up the 3rd (tied) most sacks with 28 and the 2nd most giveaways with 19. Philadelphia recorded 3 sacks, 2 interceptions, and held Denver to 17 points last week. In his lone start of the season last week, Brock Osweiler posted a 19/38, 208, 1:2 line, taking 3 sacks for a 53.4 passer rating. New England’s defense is not a good unit, but Osweiler is worse, and will make for a weekly target while he starts. Carolina Panthers – Salaries: DraftKings (DK) – 3500, FanDuel (FD) – 4900. Carolina’s salary ranks them 6th/5th on DK/FD, respectively. The betting lines with the Dolphins has the game total at 39.5 points (2nd lowest on the board) with the Panthers as -9 point home favorites. The Dolphins’ implied team total is currently at 15.25 points and the Panthers are currently at 24.25 points. Carolina ranks 2nd in sacks with 29, 1st in yards allowed with 274.1/gm, and 4th in points allowed with 17.7/gm. Carolina also ranks in the top six in fantasy points allowed to QBs and RBs. Carolina registered 2 sacks, an interception, and held Atlanta to 20 points last week. Miami ranks 28th in fantasy points allowed to defenses, 5th-worst (tied) in interceptions with 9, last in points scored with 14.5/gm, and 2nd-worst in yards gained with 270.3/gm. Carolina should give Jay Cutler a most unfriendly welcome on Monday night.